ENCUENTRA24.COM launches property credit calculator in conjunction with Scotiabank to support more than 3.1 million monthly views of properties. A button is positioned next to the price of homes for sale, which greatly facilitates the sale of the property posted online. We paid special attention to making it quick and friendly, according to the main queries of each user. Online trading is now easier and safer. This is evidenced by the more than 4 million monthly visits to Encuentra24.com, a site that will start offering this week the first credit calculator for the purchase of properties published on it in partnership with Scotiabank in Costa Rica. The Real Estate section receives more than 3.1 million page impressions per month for properties in Costa Rica. Boris Métraux, CEO and co-founder of Encuentra24.com, who was an integral part of the development of this new tool, said: "We paid special attention to making it quick and friendly, according to the main queries of each user." "Buying a property can create a lot of expectancy. Knowing the monthly price that you will have to pay toward the mortgage of a property, it is easier to make the decision to buy according to your family’s income. Property owners and brokers can publish their listings and offer them to potential buyers. Currently, there are about 10,000 publications of homes each month," Métraux concluded. A survey of 650 real estate agents in Costa Rica - who work in conjunction with Encuentra24.com - revealed that the page generates an average of 600,000 contacts between seller and buyer per year in the Real Estate section, including emails and telephone contacts. How does the Monthly Fee Calculator work? "There is a button with the logo of Scotiabank that invites visitors to 'Calculate Your Fee.' The button is positioned next to the price of homes for sale, which greatly facilitates the sale of the property posted online," said Boris Métraux. 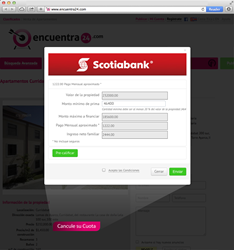 In addition, there is a form that visitors can use to get a quote directly from an officer of Scotiabank, which creates a direct channel from Encuentra24 towards the Housing Loan Division of Scotiabank Costa Rica. The form contains the minimum premium amount, the estimated monthly payment, and approximate family income. The customer can fill out the form with his information to apply for the credit. The use of a credit calculator is completely free and without obligation. The consumer can know instantly if he pre-qualifies for a mortgage, and he may be contacted by an executive of Scotiabank without having to wait for long lines or to fill out lengthy forms, which facilitates and promotes the purchase of the property. Encuentra24.com offers many services to its users, and this includes the listing of real estate property, advanced home search and search by map, and a price-per-square-meter calculator according to each area. "The listing of a property is an intuitive experience. The system asks all the important questions to highlight the most important aspects of each property and does not charge commission over the properties listed for sale," said Wendy Jordan, general manager and co-founder of Encuentra24. Encuentra24.com AG is a Swiss Company and is a leader in online classifieds in Panama, Costa Rica and Nicaragua with more than 4 million monthly visits and 65 million monthly page-views. During the last 8 years, it has grown over 20% per year. The website is useful for online marketing and digital advertising for property, businesses, classified ads, automobiles, real estate, job openings, and more. The ads remain for the time the client wishes as long as it is kept updated. You can update it as often you like.